The 16th International Conference of the SGBED is organized in partnership with the 12th ESPM International Conference in Management and 14th ESPM International Symposium of Management and Marketing. THE MANUSCRIPT SUBMISSION DEADLINE EXTENDED TO FEBRUARY 28, 2019. Marketing Healthcare, Services such as Sports, Eco-Tourism, etc. Note: Information on company visit and optional Cultural Tours will be posted on the conference website. Cancellation after May 10, 2019: no refund. 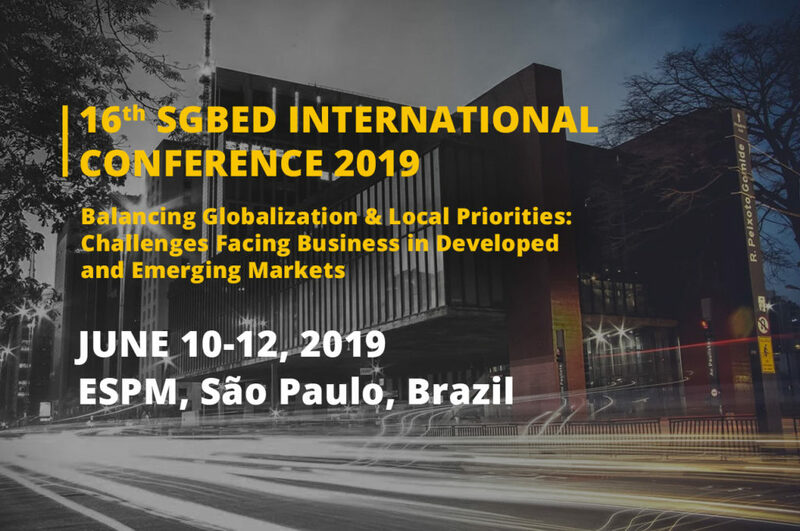 Please, all cancellations must be notified by e-mail sgbed2019-sp@espm.br to the Conference organizer. Consumer brand relationship with companies, places, retail stores etc. The relationship between the creative economy and cities: clusters; creative cities; regional development; etc. Creative economy and globalization: international trade; “cultural exception”; global institutional governance; etc. Globalization/Glocalization and competition: How countries compete?